Matsuri Sumitaya, founded in 1947, is one of the few retailers in Japan which specialize in festival goods. 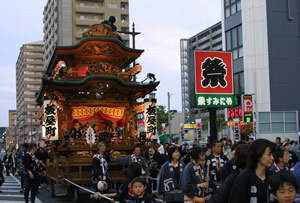 Throughout the spring to autumn seasons, festivals are held across many regions in Japan, including the famous Sanja Festival of Asakusa, Tokyo. We are proud to be the keeper of the Matsuri (festival) tradition through providing festival participants’ costumes and accessories. Welcome and enjoy the cool & stylish Matsuri goods from our shop! Japanese “Matsuri” originates from Shinto rituals to enshrine the divinity, at which people praised and showed obedience to the shrine. Now matsuri refers to wider range of occasions including celebrations, festivals, events, cultural / commercial programs where people meet, mingle and feel the sense of unity. Energy from vast number of people consolidates to exude an enormous magnetism and participants are wrapped in a kind of excitement and elation that cannot be felt in everyday lives. Strong sense of ties exists in the matsuri that binds people together, and communities are formed transcending age, danger and ethnicity. Matsuri costumes originate from the clothing professional carpenters wore during the Edo period. Basic Matsuri style consists of skin-tight Harakake (apron), Momohiki (leggings) and Koikuchi Shirt (buttoned shirt with three-quarter sleeves). On top of this basic style, Happi coat is worn which was designed specifically for the community or group one belongs to. *Company Name: Matsuri Sumitaya Co.,Ltd. *You can use Japanese or English only. We accept payment by PayPal. Please note that if payment through PayPal cannot be confirmed within 7 days from the order confirmation e-mail date, order will be cancelled automatically. When ordered from an english page, the automatic reply will be sent in English, with the shipping fees applicable for delivery to an address within Japan. Please wait for the shop to contact you with international shipping fees to be delivered to your address. The delivery time is estimated to be approximately 4 business days after shipment. *Please check the link provided below for more. Regarding our customers' personal information (address, name, e-mail address, etc. ), we are taking the utmost care. Your personal information may be used for, and be used only for conducting our business.